Washington Post columnist and noted critic of the current government of Saudi Arabia, Jamal Khashoggi, was seen entering the Saudi consulate in Turkey, on Oct. 2 and no one has seen or heard from him since. Turkish police claim he was murdered and his body chopped to pieces and smuggled out in a car, which sounds as gruesome as it is intended to be. While no accusations can ever be taken at face value, there's no question that something happened to the American citizen, and Saudi Arabia was possibly behind that. 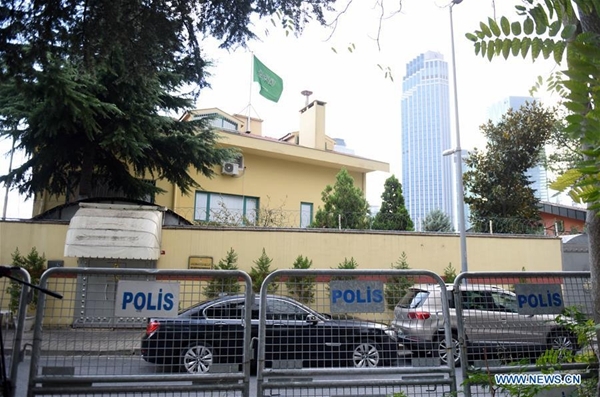 The consulate's security cameras were turned off, evidence removed, and Saudi Arabia has simply refused to offer any explanation, especially since Turkey has asked it to provide evidence Khashoggi left the building he was definitely seen entering. "Consulate officials cannot save themselves by saying that he left the building," President Recept Tayyip Erdogan was reported to have told the BBC, adding that if the journalist did indeed leave the building, there must be some footage somewhere. This, fits a pattern and has resulted in a shock across the West. Mr. Khashoggi was not a dissident, but a journalist who was critical of the new Crown Prince, known in the West as a reformer. However, he was afraid for his life, and fled the Kingdom for the West. This also reminds us of Russia being accused of seeking to murder dissidents in the United Kingdom, with the use of toxic and radioactive chemicals and poisons. However, this raises uncomfortable questions. This also comes immediately after a string of high-profile murders of journalists across the EU, including in Bulgaria, Malta and Slovakia. The Saudi Crown Prince came to prominence as a reformer. He arguably was planning to diversify the economy, and open up roles and jobs for women in the ultra-conservative Kingdom, including allowing women to drive cars. In return, he was aided by a massive PR campaign by the enormously powerful Saudi lobby in Washington DC, including full page profiles in mainstream newspapers, and fawning praise by paid columnists. In fact, President Donald Trump's son-in-law is supposed to be a close friend of the Prince. That in turn helped U.S. with its anti-Iran narrative in the Middle East, as any adversary of Iran is by definition an ally of the United States. However, it poses long-term questions about global politics and the liberal world order. Imagine any other country doing what the Saudis are accused of in their embassy. It is unthinkable that Russia, or Venezuela or Iran would go and do this without there being calls for retribution, sanctions, or even a declaration of war. For a country claiming to be the home of democracy and rule of law and minority rights, and one that supposedly condemns autocracy, America seems to be behaving very differently in its treatment of Saudi Arabia. And that certainly reeks of a double standard. There is certainly serious antagonism against Saudi Arabia even within the United States. Saudis are viewed by a strong bipartisan population as the biggest purveyors of Salafi jihadism and are considered a nuisance even within the strategic community. From research by think tanks like the CATO Institute, to research papers in the journal Foreign Affairs, two points are clear: the U.S. doesn't need Saudi oil, as America is an energy-producing country itself; meanwhile, Saudi Arabia is using the U.S. to continue pursuing regional hegemony against Iran and there's no reason for the Americans to support it. Saudi bombing of Yemen has also caused consternation in the global human rights movement. Saudi influence in Washington is extremely high, and these issues are not gaining sufficient traction due to Saudi lobbying efforts. However, if the U.S. desires to continue being called the leader of the liberal rule-based order, the time to show it is now, by reining in Saudi Arabia. After all, kidnapping and murdering a journalist in an embassy is the most heinous way to break all rules of civility and diplomacy. If U.S. desires to continue being called the leader of the liberal rule-based international order, the time to show it is now, by reining in Saudi Arabia amid allegations of the murder of a dissident in its consulate in Turkey.